Abstract: How have the policies of recent administrations shaped today’s economy? To what extent has federal policy contributed to growth in income inequality? Why have the parties become so polarized and how has polarization influenced economic policy? This book provides an introduction to the contemporary political economy of the United States. It examines the politics of economic policymaking, the influence of federal policies and programs on the economy, and the co-evolution of politics and the economy over the past five decades. Along the way, it explains the causes and consequences of many contemporary phenomena, such as the government’s deficits and debt and the ideological polarization of the parties. The book is divided into two parts. The first half explains how America’s political economy “works.” It explains what the federal government does, why it does what it does, and how its policies influence the economy. The second half explains “how we got here” with a review of major political and economic developments since the 1970s, all the way up to the early years of the Trump Administration. This weaving together of theory and history provides both the tools and the context so that readers can properly understand the nation’s current-day politics and policy debates. Available at Routledge and Amazon. 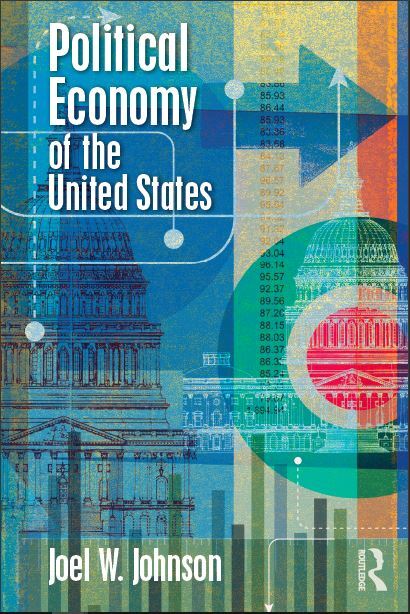 "Political Economy of the United States delivers a balanced, thorough, and lucid assessment of the complex reciprocal relationships between America’s economic and political systems. Johnson’s masterful synthesis is nuanced and sophisticated but presented in a style fully accessible to undergraduates. It would make a perfect complementary reading for the introductory American politics course."